With an average of 226 cloudy days a year (according to National Geographic), Seattle can be a tricky place to work with concrete. "Sometimes I feel like our new motto should be, 'When it rains, we pour,'" says John Belarde, owner of Belarde Co. Inc. in Woodinville, Wash., a drizzly Seattle suburb. Belarde, who has been involved in concrete for virtually all of his 55 years, has devoted the last decade to raising the bar for decorative concrete in the region. Raised in Anchorage, Alaska, Belarde moved back to his home state of Washington 20 years ago, when the family business relocated. The company his father founded, John-Wayne Construction, specializes in slip-form construction and heavy-duty highway work, and Belarde grew up doing just that. "I had a really rounded education and experience with all kinds of concrete," Belarde says. However, his passion has always been for decorative work. So 10 years ago, when a Bomanite decorative concrete franchise became available for his part of the state, Belarde struck out on his own, leaving the family business behind. 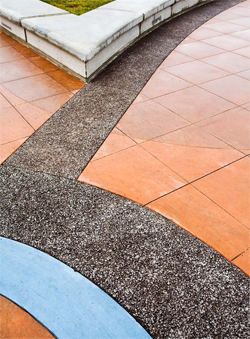 When Belarde Co. was founded, the company specialized in stamped, stained and imprinted concrete. It was a natural place for John Belarde to start, since he had done some decorative concrete work with his father's company. As the years have gone by, trends have come and gone and Belarde has worked very hard to stay on top of them. Being a part of the Bomanite group, he says, has been a big part of that. 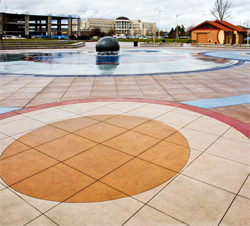 When he first got into the business, Belarde says, the Pacific Northwest had not had much exposure to decorative concrete. Being part of such a large network of decorative contractors gave him access to a lot of emerging techniques and technology that were gaining popularity in other, sunnier parts of the country. "It helped me a lot to bring new ideas and technology to our area," he says. In addition to his Bomanite connections, Belarde is also a Lithocrete licensee, and he has made it a point to get involved with other professional associations - not only to interact with the concrete community, but also to get his name out there. In addition to his memberships in the American Society of Concrete Contractors and the Associated General Contractors of America, Belarde is affiliated with the Washington Aggregates & Concrete Association, which awarded him the Best Decorative and Best Overall Concrete Project in 2008 for the Kent Town Square Plaza he did in Kent, Wash. Being involved in professional associations like the ASCC, AGC and WACA has been particularly helpful for making connections with the architectural community and with municipal planners, which is key for Belarde. Early on in his company's history, Belarde made the decision to run a union operation, which has had a major impact on the way they've developed. "It was difficult, at first, with smaller projects," says Belarde, "but in the end it's been very beneficial for bigger projects that have to be union jobs." Because of that early decision, Belarde Co. has relied on commercial and municipal projects for the majority of its contracts. Another factor in the development of Belarde's business has been his personal history with other aspects of the concrete trade. Over the past few years Belarde says his company has ended up splitting their time on the job between decorative work and other concrete pouring and construction. While Belarde will initially sign on as the decorative subcontractor, he says that once they're on-site, the general contractor may award them a lot of the other concrete work as well. "It has been very beneficial to have that expertise," says Belarde, especially considering the state of the economy. This last year, in particular, Belarde says that only about half of their on-site time has actually been spent doing decorative work, compared to two years ago, when that figure was more like 85 percent. 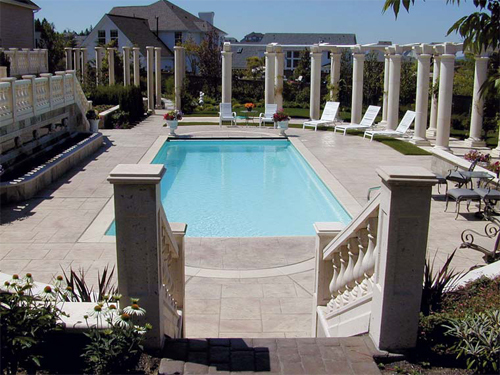 Despite the slimming of their clients' decorative budgets, Belarde's priority is still promoting both the company's decorative expertise - "Decorative concrete will always be forefront and foremost on our agenda," he says - and the craft as a whole. "That's where my time is spent," he says, "educating our design community on the different kinds of decorative concrete that's available." This education, Belarde says, is of particular importance in his region. 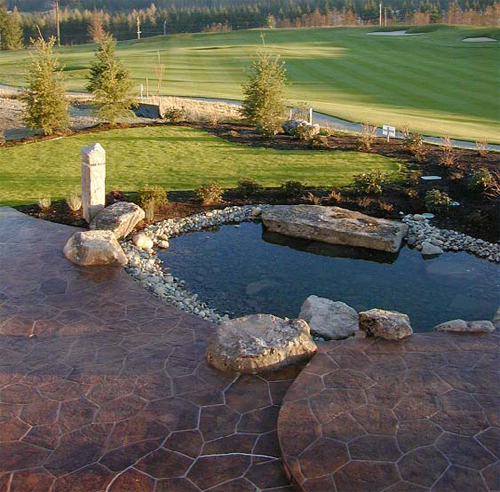 "(Decorative concrete) in the northern climates is slightly behind the curve," he says. "Always has been ... maybe always will be." Belarde spends a lot of his time promoting new technology and techniques. For example, he says that in the past few years, the stamped and imprinted finishes that once made up the majority of the company's work have been giving way to a newer trend. Exposed-aggregate systems (like Lithocrete, Aggretex and Bomanite Exposed, three systems Belarde represents) have been growing in popularity, he says. "Those are the systems that are getting more of a 'Gee whiz!' kind of thing (from architects and designers)," he says. "You can do so many different things. You're not governed by just pattern and texture." Belarde's also been shaking things up, sandwise. "Our sand in this region has a distinctive dark gray color," he says. "It has a way of diluting any other colors you put in." So Belarde's been importing sand from other parts of the country - in particular from the Sun Belt. The lighter colors of sand, he says, "give us a little more control over our colors." He's also had a lot of call, recently, for graphics work - he just did a series of Seattle-area bus stops along a stretch of Highway 99 in Snohomish County that feature regionally inspired artwork done on a Bomanite Micro-Top surface with Surface Gel Tek's Flattoo system (another Sun Belt import). While these job-site insights stem from his decades of experience, these days Belarde finds himself less and less in the field and more and more in the office. And that's a hard transition to make, he says: "When you started out something yourself - mixing stains and putting saw blades on - it's hard to give up because you think nobody can do it as well as you." But Belarde has come to the realization that running a job as a contractor and running a company as a CEO require two different mindsets. So he's joined a group called Vistage International, a global executive coaching organization that runs regular meetings and retreats for CEOs from a huge variety of fields. Belarde says that just getting together with other business owners to discuss what it takes to grow and run a company has been extremely valuable, even if it keeps him away from the job site. "It might take away from my passion for working hands-on," he says, "But it prepares me better for our clients, prepares me to be a better business leader."